Buoyed by a wave of hype that has won them an NME best up-and-coming band gong and drawn them inclusion into the BBC’s very own much-hyped Sound Of 2011 list, New Zealand’s The Naked And Famous have been beneficiaries of all the right words in all the right places. To an extent, the hype is justified. Passive Me, Aggressive You certainly has its moments of brilliance, when the band’s euphoric electro catches fire with its dingy distortion. It’s this clash of the subtle and the strong — the passiveness of Alisa Xayalith’s vocal offset by the aggressive Nine Inch Nails guitars of Thom Powers — that sets tunes such as ‘Spank’, ‘A Wolf In Greek’s Clothing’ and ‘Frayed’, apart. There are other tricks up their sleeves too. At their most arresting — namely on opener ‘All Of This’ and recent single ‘Punching In A Dream’ — the five-piece marry this boisterous bedrock of sound with shimmering, showgaze melodies that twist and turn as they weave themselves into the subconscious. As the album progresses however, it begins to settle upon a retro-80s vibe and, as such, loses its edge. The boy-girl vocals, the euphoria and the poppy-synths all begins to sound a little 2000-and late. It’s as if The Naked And Famous have arrived just as the party has ended, the credits for Skins have rolled and the last sounds of ‘Kids’ are fading out. No doubt the festival-friendly catchy choruses of ‘Punching In A Dream’ and ‘Young Blood’ will have their desired effect this summer, but it’s hard to listen to these two tracks in particular, without feeling they’ve been stitched from threads laid out by Andrew VanWyngarden and Ben Goldwasser. Closer ‘Girls Like You’ throws some LCD Soundsystem comparisons into the mix, and by the time Passive Me, Aggressive You ends — despite all that’s going on and despite a flurry of rather fine flourishes —you’re left with little of real substance to grab a hold of and a rather hollow feeling to boot. © Steve Cummins. All rights reserved. Originally published on State.ie in October 2010. I’m liking this debut by the teenage duo who make up First Aid Kit more and more on each listen. Just feels real. There’s Oberst, Newsom and early Jewel in there…but mostly there’s the brilliant Hem. 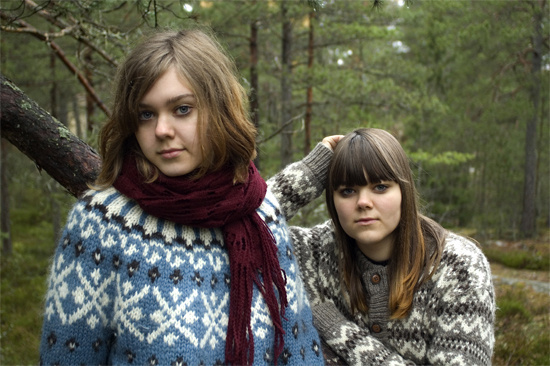 You can read my review of First Aid Kit here which has put Hem’s Rabbit Songs back on my stereo. Rabbit Songs is one of my favourite albums ever – near-perfect melancholic indie folk. I’d highly recommend it being bought/ downloaded/ even nicked! Yes, he of The Strokes. Went to see Julian play on Monday night. He’s got some horrible reviews for his solo live shows, though equally he’s been afforded across the board praise for his solo debut LP. It could have gone either way. Thankfully he was very much on form. You can read my live review for State here. Obligatory Casablancas Christmas tune below. Went to see The Airborne Toxic Event on Wednesday night (live review here) and wasn’t at all impressed – disappointed actually. I picked up their debut album back in San Francisco last May after reading an interview with frontman Mikel Jollett. I liked his back story – a novelist who after a failed relationship, finding out his mother had cancer and developing an autoimmune disease himself, found himself creating stories more suited to song than the novel structure. He thus formed ATE and released an acclaimed debut on an indie label, which was than picked up by a major (Island). The album isn’t great. It’s really bland indie-rock in the mould of Razorlight. Lyrically there’s some fine moments though and, as you might expect, they’re quite good with forging story songs you can quite easily sink into without having to grapple with. There’s not much mystery, and that’s fine for a throwaway pop song. They hit gold with ‘Sometime After Midnight’, a song you’ve probably heard on the radio and one which many, it would seem, can relate to given its tale of unexpectedly bumping into an ex-lover in a nightclub. Its like a more emotive and better written version of ‘Mr Brightside’. What kind of amazed me upon returning to Ireland (I’d been in Asia, Australia and new Zealand for the previous nine months) was that they were apparently so popular here that they were headlining the Olympia, a fairly large venue in Dublin – yet nobody I knew had much interest in them or nor had they been written about on the UK and Irish websites I kept tabs on. Anyone who had, described them as somewhere between Arcade Fire and The Strokes – which I didn’t really get at all on record….well only that they sounded like very very diluted versions of those acts. Anyhow, I went along interested in seeing what they were like live (Although, in hindsight, I think I may have seen them support The Fratellis in 2007/ 2008. Jollett mentioned onstage that this was their fifth time playing Dublin having played three times this year alone). Perhaps they had something about them which translated better live than on record? So many acts find it hard to shine on both mediums. But nope, they were poor. You can read my full review for State here. I wish I’d gone to see Mark Eitzel instead. Port O’Brien. Yep they’re from Alaska/ North California with a nice back-story to boot. New album is out now and you can read my review here.